Does it feel like you're just pinning and pinning without any real direction, purpose, or noticeable effect on your metrics? Maybe you just KNOW you could make it big if you could just figure out what steps to follow each day, week, or month. Because every business, niche, and audience are different, there’s no one “right” way to promote your business on Pinterest - but there are definite guidelines and best practices to follow to ensure that you’re making the most of this awesome platform! In this post, I’ll help you come up with a plan to grow your Pinterest account over the next weeks, months, and even years. Ready? Let’s get started! 1) Make Your Profile Stand Out. We've talked before about creating a great Pinterest profile, and it really is important. You want to target and attract the right people - Pinterest won't do you any good if your Advanced Tattoo Care articles are being shown to Grandma Ethel (Unless Grandma is inked - no judgment! ;) ). Keep it simple and to the point. Throw in your Call To Action at the end. Your profile photo is the "face" of your brand. I always recommend a personal photo or headshot instead of a logo, but you can do whatever feels best. In order to succeed on Pinterest, you need to have a good foundation upon which to build your account. This foundation consists of your boards, your pins, and the people or boards you follow. Pinterest recommends starting out with no less than 5, but I usually recommend starting with at least 10-15. These boards should be on-topic within your niche, have their descriptions filled out with relevant keywords, and have searchable, relevant names. Group boards are another great way to grow your Pinterest reach, so join a few! Only join as many as you feel you can keep up to without getting overwhelmed. When setting up accounts for my clients, I fill each new board with 25 pins. Choose pins that are well-made and are relevant to the board topic. When pinning your own content, it's important to make sure that your pins are high quality. Your descriptions and titles need to have well-researched, good-quality keywords as well. These are pulled from your website or blog (as long as you have Rich Pins enabled). Followers on Pinterest aren't very important, so don't dwell too much on that number. I usually suggest starting out by following about 100 other pinners or boards in your niche. I often head over to those "Social Share" threads in my favorite Facebook groups to find more pinners to follow, or just type in a few of my keywords in the search bar and select "Pinners" or "Boards" instead of "Pins". Consistent, daily activity is a must on Pinterest. While the bulk of this can be done through schedulers (like Tailwind or Boardbooster), it’s still a good idea to pop into Pinterest once a day. I usually recommend spending about 10 minutes per day pinning and following some new Pinners or boards. It doesn’t have to be a lot - even just pinning 5-10 things “live” and following 3-5 accounts will keep you “active” on Pinterest. Every Saturday, I head over to Tailwind and do my scheduling for the upcoming week. There is no “right” amount of pins to schedule each day, but try to do at least 10. There’s no solid evidence that any more than 30 pins per day does anything for your reach, so don’t stress yourself out and think that you need to pin 50 things every day! First, I schedule out my own content. Keeping in mind each group board’s rules, I schedule my content out to all my group boards and then to relevant personal boards. Then, I head to my group boards and schedule a few pins from each. This is a great way to find relevant content since group boards are usually based on a common topic (like mom blogging, recipes, etc). After that, I head into the “share” or “promo” threads in my favorite Facebook groups and choose the posts that are relevant to my audience. This is a great way to find great content and also supports some of the newbies who may not be super active on Pinterest yet. If you use Tailwind Tribes (I don’t), you can schedule content out from there at this time, too. Once a month, it's a good idea to swing into Pinterest Analytics and do a quick checkup of how things are going. You can do it more often (weekly, if you like) but Pins can take a while to gain traction on Pinterest, so I found that checking more often just stresses me out! It's a good idea to use Google Analytics along with Pinterest Analytics (and Tailwind too!) to give you a bigger picture. Inside your Analytics, you can see which of your pins are performing well and which aren't, and use that information to decide whether to make changes in your strategy, descriptions, or images. Immediately after publishing a new post (for the sake of keeping things simple, I’m going to pretend we’re all bloggers - but you can definitely apply this to anything you’re promoting on Pinterest), pin the new post to the board that has only your own content. From there, you can pin it to all of your relevant group boards, personal boards, tribes, etc. I personally prefer to do this with Tailwind so it doesn’t all come out in one big lump and risk making Pinterest think I’m doing weird spammy things. One way to make sure this step happens seamlessly is to create your Pin graphics ahead of time, or to make sure that you have a template to use. Pinterest is a long-term thing - it takes a while to grow and build momentum. The most important thing is to be consistent in your pinning. Showing up regularly (manually or with a scheduler) is vital to your Pinterest success. Keep at it! 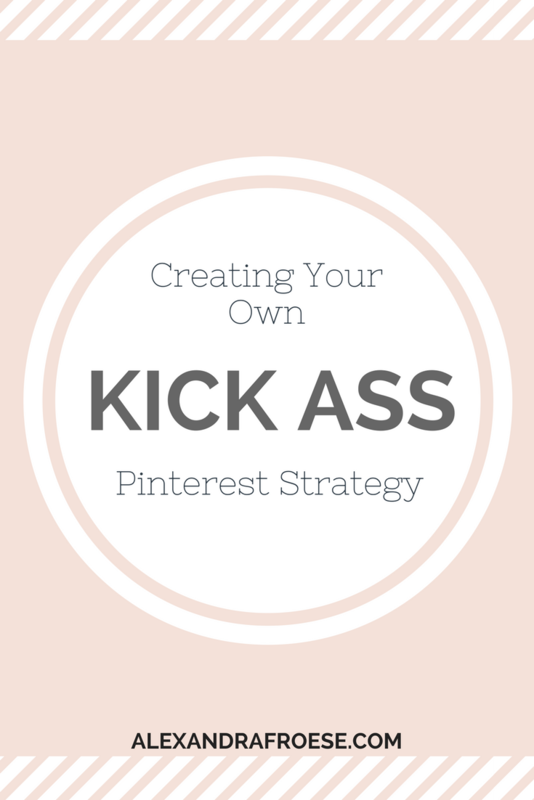 Not getting the traffic you want from Pinterest? It's time to book an Account Audit! Each audit package includes a personalized Strategy Plan to ensure you're getting the most out of the platform.